How much does it cost to travel to Dubrovnik? How much money will you need in Dubrovnik? kn384 ($58) is the average daily price for traveling in Dubrovnik. The average price of food for one day is kn151 ($23). The average price of a hotel for a couple is kn348 ($53). Additional pricing is in the table below. These average travel prices have been collected from other travelers to help you plan your own travel budget. How much money do I need for Dubrovnik? Dubrovnik, the "Pearl of the Adriatic", is a beautiful walled city in southern Croatia that sits on the edge of the Adriatic Sea. It's a small city, with only about 40,000 residents, but it's become one of the most significant tourist destinations in the Mediterranean. It is also a UNESCO World Heritage Site. The city was historically build on maritime trade. It was a center of language and literature and was the home of many important poets, playwrights, painters, and scientists during the 15th and 16th centuries. Today its economy is dependent on tourism and it is one of the most popular destinations in the region. People visit the city for its impressive history, beautiful setting, great weather, and interesting architecture. There are many historic sights spread throughout the Old Town. Some of the most famous include the Bell Tower, Roland's Column, Sponza Palace, Rector's Palace, Pile Gate, Placa Stradun, Big Onofrio's Fountain, Old Port, Fort Lovrijenac, and Visia Dubrovnik 5D Theatrum. Famous churches include Franciscan Monastery, Cathedral of the Assumption of the Virgin Mary, Church of Saint Blaise, Church of St. Ignatius and the Jesuit College, Dominican Monastery, Church of St. Sebastian, and Serbian Orthodox Church Museum of Icons. Most people visit Dubrovnik specifically for its Old Town. This is the area enclosed by the historic walls. Here you will find most of the city's main attractions and sights. There are many historic buildings with interesting architecture and histories. There are also many great restaurants, cafes and shops, many of which cater to tourists. The main street of Old Town is Stradun-a, which is just under half a kilometer long. It runs from Pile Gate at the west entrance, to Ploce Gate at the east entrance. It's lined with many shops and restaurants. Ploce is the neighborhood that is just outside of Ploce Gate. It is where you will find some of the city's nicest hotels, many of which are on the waterfront. There is a public beach available here as well, called Banje, where you will find the EastWest Beach Club. Lapad is the peninsula that is west of Old Town. There is a wide, pedestrian only street that has many hotels and restaurants, but other than that there is little to see or do as a tourist. There is a residential area and some beachfront. The hotels in the area are mid range in price and there are several buses that connect the area with Old Town. The Banin Kuk neighborhood is found on the Lapad Peninsula. It has a variety of hotels across several different price ranges and a few restaurants and shops. From here you can also access some of Dubrovnik's pebbled beaches. You can reach the Old Town area by bus from here as well. Interesting activities around Dubrovnik include sailing, boat tours, taking the newly reopened cable car and cliff jumping. Popular festivals in the city are the Dubrovnik Summer Festival and the Libertas Film Festival. Local seafood and traditional meat dishes are available at most of the restaurants around Old Town. The dishes are usually fresh and good, and prices are reasonable. There are some cheaper, touristy places that vary in quality, but will give you a filling, cheap meal. The other alternative is the higher end, fine dining restaurants. These offer interesting, high quality meals for a more expensive price. There are also some pizzerias around that have decent pizza that is reasonable in price. Because Dubrovnik is such a popular tourist destination, you can expect to pay more for a comparable meal than you would elsewhere in Croatia. If you're in town during the low season between November and March, most of the high end restaurants are closed. The touristy eateries that remain open will charge a high price for low quality food. It is possible to negotiate the price, and it is recommended that you try. Although the Old Town is a network of small streets that can be difficult to navigate, a good system of signs make it easier to find your way than you might expect. There are signs advertising businesses and attractions at most major intersections. The entire Old Town is pedestrian, and it is easy enough to walk around. Many people end up staying outside of Old Town, and most neighborhoods are connected by bus. Almost all buses eventually end up in the Old Town, but some take more direct routes, so you should find a timetable and route map just in case. Day passes are available for buses as well. If you're making your way from the Main Bus Station to the Old Town you can take buses 1, 1A and 1B. These buses run constantly. 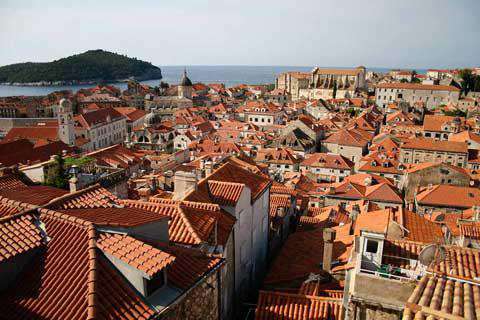 Make sure you stay in the old town in Dubrovnik, Croatia. It's part of the experience. Pay a little extra and stay in a convenient location near everything in town.